Malignant glioma afflicts approx 10,000 patients per year in North America. Since the publication of the Brain Tumor Study Group (BTSG) 6901 study results in the late 1970s, the standard management of patients with malignant glioma has been maximal surgical resection without compromise of neurologic function, followed by postoperative cranial radiation therapy (RT) to 60 Gy with or without nitrosourea-based therapy (1). The term malignant glioma includes a heterogeneous group of tumors including anaplastic astrocytoma (AA), glioblastoma multiforme (GBM), anaplastic oligodendroglioma (AO), anaplastic mixed tumors, and malignant glioma not otherwise specified. These histologies are associated with different responses to chemotherapy and radiation therapy (RT) as well as different natural histories and survival expectations. Typical median survival times (MSTs) with therapy for patients with GBM and AA with standard therapeutic approaches are 10–12 mo and 30–40 mo, respectively (2). Genetic characteristics of primary brain tumors have been correlated with treatment response and clinical outcomes as shown by Cairncross et al., who demonstrated that allelic loss of chromosome 1p predicted increased response to chemotherapy and longer survival (3). Despite improvements in operative and perioperative management, radiotherapeutic techniques, and supportive measures, little progress has been made in prolonging survival for the majority of patients with malignant glioma. 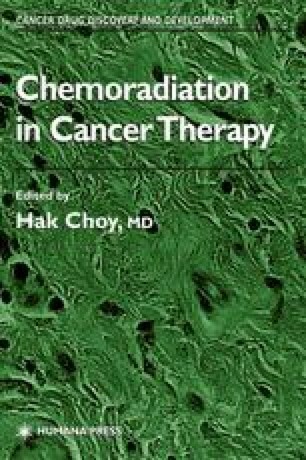 The purpose of this chapter is to review the literature on the combined modality treatment of patients with malignant glioma, focusing on the data from prospective randomized trials, and to briefly discuss future directions in research to improve outcome for patients affected by this disease.